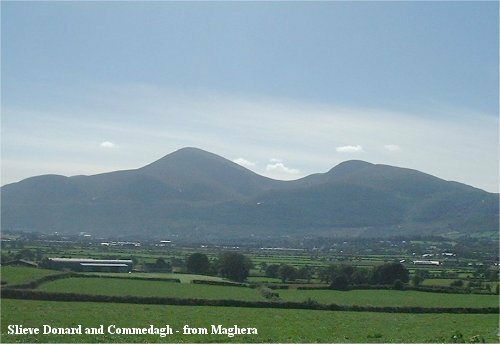 Any reference to Downpatrick or County Down would be incomplete without mention of the Mountains of Mourne which dominate both. They are my favourite place for walking. Whether in sunshine, rain, cloud or snow they provide an ever changing perspective of light and colour. There is solitude and peace there for the solitary walker. The sounds of the busy world recede with only the wind and the raucous call of the raven for company. The Mourne mountains rest on a base of ancient slate and shale which dates from the Silurian period- 440 million years ago. Formed by layers of horizontal sediments in an ancient seabed, the shales underlie most of County Down. 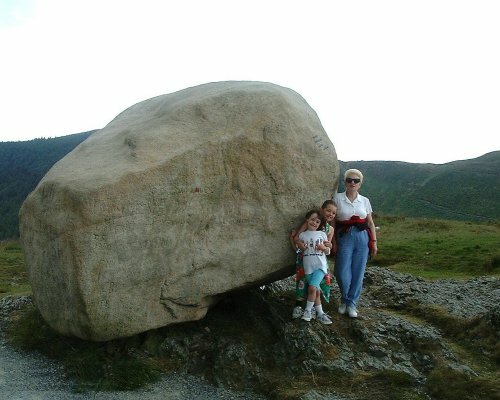 The Mourne granites are from the Tertiary period- 50 million years ago. The Mournes developed by the slow sinking of a circular block of shale some 10 km in diameter, deep into the earth's crust. As it did so, granite magma welled up around the sides of the descending block and filled the roof cavity left in its place. This Cauldron Subsidence, as it is called, produced the high eastern Mournes. The lower western Mournes were formed through the collapse of a second thinner block of shale. As the granite filled the cavities it solidified in five main stages, each recognisably different. In the zone of contact with the surrounding shale the cooling granite metamorphosed the shale into a harder rock, more able to withstand later erosion. Their formation complete, the granites were hidden under an overlying mantle of the original shale, which subsequent erosion has slowly removed leaving the younger, more resistant granites intact as a ring of mountains. Periodic climatic changes in the last 50 million years, in particular the deposition and erosion produced by a series of Ice Ages, changed the shape and appearance of the Mournes. During these ages a huge ice sheet spread over the land, covering the highest of the mountains. On its retreat at the end of the last glaciation, 11,000 years ago, the ice produced the present Mourne topography. 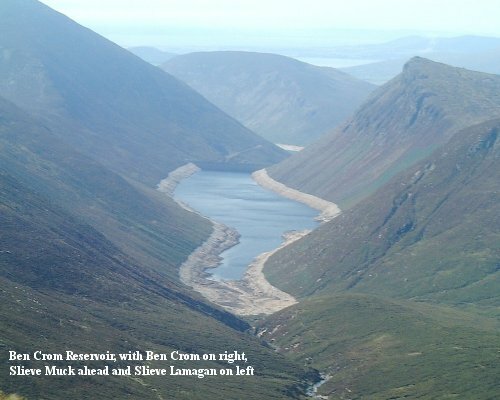 In upper levels of the mountains the movement of glaciers formed U-shaped valleys and gouged out the valley heads to create armchair-shaped hollows called corries. Frost action shattered rock outcrops, producing screes and crumbling rock faces and cliffs. As the ice sheets retreated, vast quantities of sand and stone deposited by the melting ice were left covering the coastal plain to a depth of several feet; shallow near the base of the hills and thicker near the coast, where great accumulations of glacial till were heaped in hummocky ridges called moraines. Along the northern and western fringe of the mountains drumlins were formed when large mounds of deposited drift were moulded and streamlined as the ice passed over them. Many granite boulders carried from the mountains by the ice still litter low lying areas, and many, such as Clough Mor at Rostrevor, were left on the summits of hills. Except for the high ground, the ice left a countryside covered in glacial remains. By a slow process of enrichment, minerals washed from the bedrock, and the natural compost of decaying plants and animals helped soil and vegetation to establish. 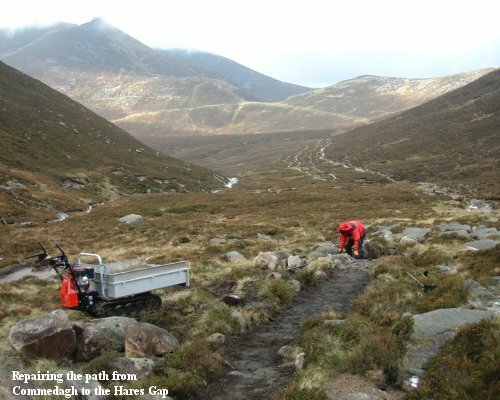 The Mourne upland is composed of hard, acidic granite, which produces a poor soil base. High rainfall leaches out nutrients faster than they can be replaced by weathering of the rock particles, making the soil become progressively more acid and less fertile. Peat bogs formed in the flatter parts of the hills where the soil is constantly waterlogged and its surface acid. The surrounding countryside was covered with glacial drift, enabling the development of a diversity of soils, reflecting the composition of the base material. They range from deep acid sands on the coastal plain to shallower, more fertile on the northern foothills of the mountains. Before the early Celtic farmers cleared the land for agriculture and their grazing animals prevented tree regeneration, broad-leaved woodland covered the Mourne lowland and hillsides. Today's Mourne countryside is a mosaic of fragmented habitats surviving in a landscape dominated by human land use. The general pattern is from farmed lowland with thin corridors of native trees remaining in hedgerows and along riverbanks, through marginal land across which scattered trees and gorse scrub give way to sheep-grazed heather hillsides. At higher levels dwarf-shrub heaths and grasslands occur, with a zone of stony moss heaths on the highest ground. Other special habitats, such as screes, cliffs, bogs, lakes and streams are found at various elevations throughout the landscape. 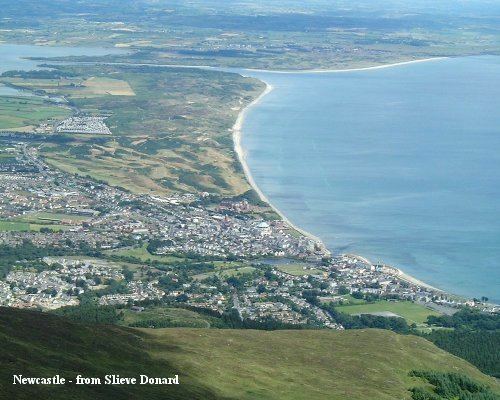 The Mourne upland is dominated by a compact ring of 12 mountain summits, each rising above 600 metres, with the highest peak, Slieve Donard, reaching 852 metres. Along their eastern edge the mountains drop steeply towards the coast, but sweeping west towards Carlingford Lough they form a more continuous plateau. Though smaller in extent and lower in elevation, the neighbouring hills of Slieve Croob are included as an outlier of the main upland area. With the final retreat of the ice trees colonized the area. It was a productive environment for Mesolithic hunters, some of whose remains have recently been discovered. Around 5000 years ago, farming communities settled in the area, attracted by the light fertile soils. They left behind megalithic tombs, the most prominent of which are the cairns on Slieve Donard. About 300 A.D., when Ross the Red was King of Ulster, the area was populated by various clans and septs, some of whom lived in raths (small farmsteads surrounded by an earthen bank and ditch), many of which still survive. Legend tells us that Ross granted the grazing right of Mourne to Boirche. The mountains were then named as 'Beanna Boirche' (the peaks of Boirche). Only Ben Crom, above the Silent Valley, recalls the old name of the mountains. About a thousand years later, the Mughdoma clan from the barony of Cremourne in what is now County Monaghan, migrated to the area, bringing the name of their barony with them. It is from this barony that the Mournes derive their name. The coastal plain of Mourne was settled by stone age people whose cairns and dolmens are still to be seen. Viking raids began in the ninth century, giving Carlingford Lough (Carlinn Fjord) its name as they used it as a route to Newry and further inland in search of pillage. Annalong (in gaelic 'Alt na Long' (the ford of the ships)) also recalls their influence. No other trace of the Vikings remain. Mourne came under Norman influence in the 13th century, when castles at Carlingford, Greencastle, and Dundrum were built by John de Courcy. 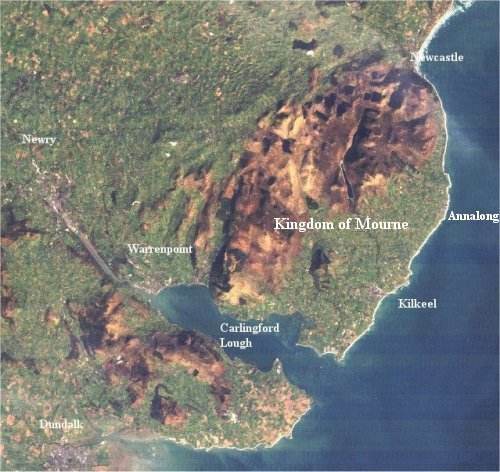 In 1552 Mourne was granted to Nicholas Bagnal. In 1715 it was inherited by Robert Needham. In 1806 it passed to his namesake, who was created the first Earl of Kilmorey in 1832. Until the early 1800s, the area's only connection with the outside world was by sea, and along the coast to Newcastle and Newry. Even with the construction of a third highway through the mountains, the coastal lowlands remained a place apart until comparatively recently. The mountains provided two important resources - granite and water. Thousands of tons of dressed granite were exported to Britain in the 1800s and early 1900s, mainly for street paving. 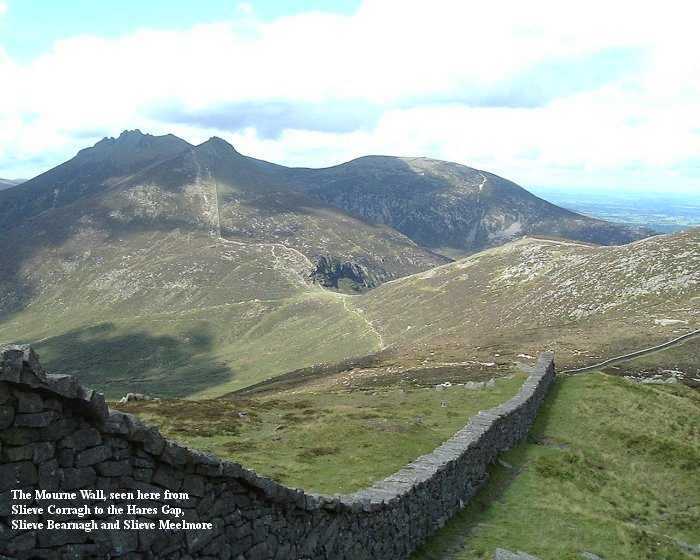 In the 1890s the Water Commissioners, to service a growing population in Belfast and County Down, decided to enclose the main catchment area of the Mourne Mountains with a wall. The wall, which stretches 22 miles over 11 peaks, took 18 years to build. It was started in 1904 and, with a break in the war years, was completed in 1922. Work started in March and ended in mid-October each year. The task of building the wall (in some places it is eight feet high), on very steep slopes, using heavy and awkward granite slabs, must have been very onerous and called for great strength and endurance on the part of the workers. Their descendants described them as "Men with powerful shoulders and hands like shovels". Many of the men who built the wall were later involved in the construction of the Silent Valley and other reservoirs. There is a third resource provided by the mountains, recreation and tourism. By the middle of the nineteenth century Newcastle, at the foot of Slieve Donard, was already a favourite Watering Place and the coming of the railway in 1869 opened up the resort to day trippers from Belfast, Portadown, Ballynahinch, Downpatrick and other places. Tours of the Mournes, including Coach connections through the mountains between Newcastle and Warrenpoint stations, which also had the effect of opening up Newcastle to visitors from Dublin and other points south, were well established by the end of the century. Over the past twenty years there has been a growing recognition of the vulnerability of the environment and of the need to maintain and preserve it for the benefit of future generations, as well as making it available for the enjoyment of the present generation. The region has been designated an Area of Outstanding Natural Beauty and an Environmental Protection Area. 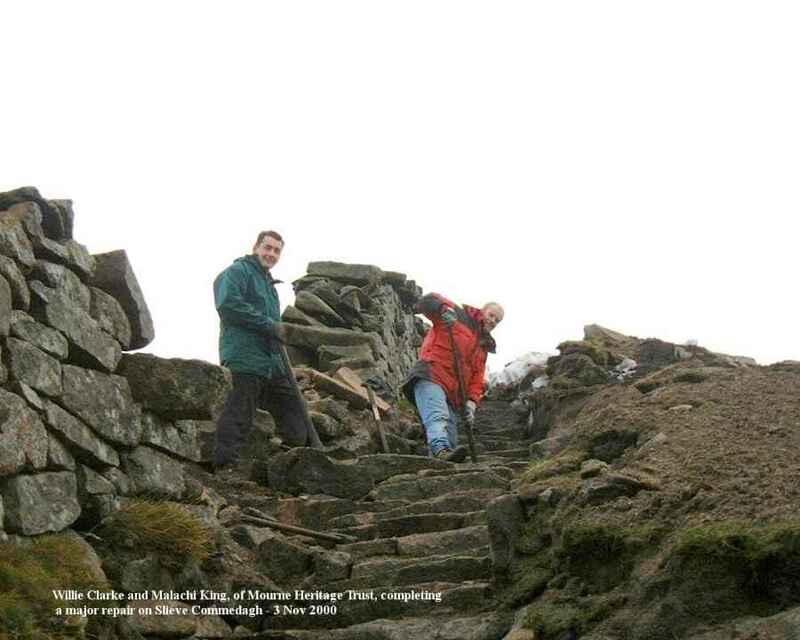 Part of it is managed by the National Trust and the Mourne Heritage Trust has been established to maintain its paths and walls. These require constant maintenance, not only to repair the ravages of the weather, but the impact of human beings. The many walkers who enjoy the mountains inevitably affect the fragile ground cover and the effects of water and wind exacerbate the damage. The Trust has launched an ambitious programme to repair the wall and the paths. Over the months I have had an opportunity to meet and chat to some the people engaged in this work. 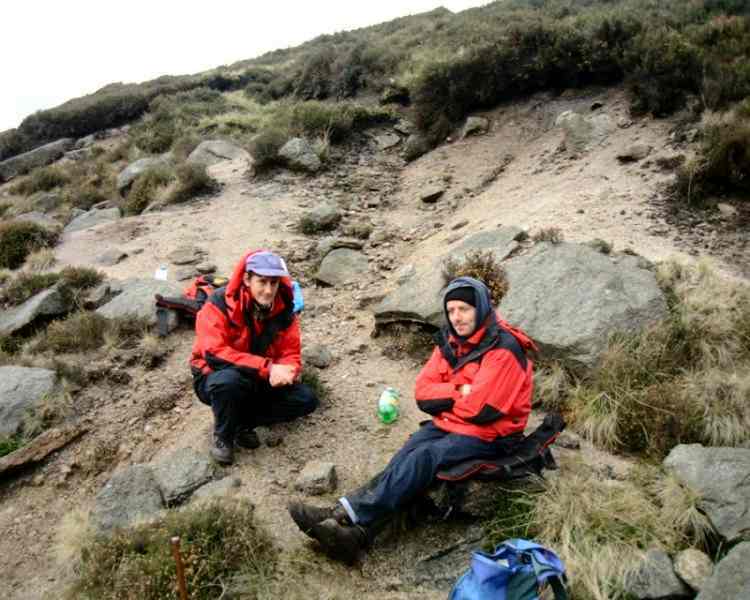 Here Shane McNamee and Stephen O'Hare take a break from work on the path. These days they have the assistance of modern technology. 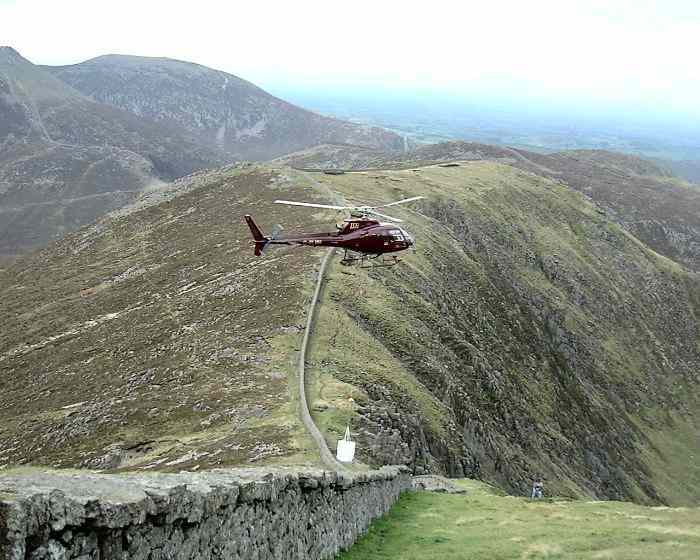 In August 2000 a helicopter ferried capstones, for the repair of the wall path, from a quarry on Slieve Binnian. The job was duly completed in November by Willie Clarke and Malachy King. Hard work but clearly rewarding as they are a cheerful and friendly team. Links: See also Raymond's County Down Website for lots of useful information and resources about the Mourne Area and elsewhere in Down. Sing a song of pleasant beaches Where the mountains meet the sea. Sing of woods and shadowed streamlets From the uplands bounding free. Sing of crags against the high sky, Shepherd's path and quarry track, Stone fringed fields, scots pine and fuchsia, All the things that call us back. Sing of remote tarn and valley, Brown bog, castellated ridge. Sing of quiet road and loanin Winding to a granite bridge. Sing of gorse and rock-strewn foothills, And of tidy homesteads where Peace-loving, kindly people Smile a Mourne welcome there.